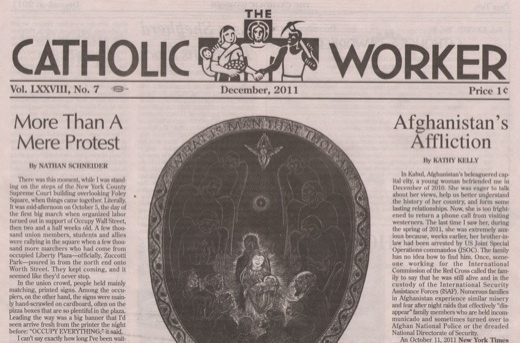 The latest issue of The Catholic Worker includes a new article of mine about covering Occupy Wall Street for Waging Nonviolence. Since the paper isn’t published online, you’ll have to see either a (slightly edited) portion of it about Dan Berrigan at Occupy Writers, or a blown-up pdf here. I’ll also be giving a talk—which was gracefully entitled for me “The Ballerina and the Charging Bull”—at Maryhouse (55 East 3rd St., New York) on January 13 at 7:45 p.m.
Sir,I like The Catholic Worker.Do you know and understand why it is so?